The patience and hard work involved in carefully looking after your potted plants – pruning, trimming, ensuring that they are watered, and generally tending to their all-around health, makes these living and breathing creatures quite the investment. You have spent months or even years caring and nurturing them that they have become a part of your family. The thought of leaving them behind when moving to a different location is a hard pill to swallow. After all, you have gone to great lengths to arrange for the transfer of your furniture and personal stuff. Why not exert the same efforts for your precious flora? Complete Removals has seen many beautiful and fascinating pot plants in our years of moving homes around Adelaide. We think that this is a good opportunity to share the safest and most effective ways to make sure that your ‘mobile garden’ arrives in tip-top shape. It is natural to have a lot of concerns when it comes to moving your treasured plants. Here are the most Frequently Asked Questions and their corresponding answers to help you out. How much space in the truck will the plants take up? A lot of people don’t realise that potted plants actually take up a lot more space in a truck than the rest of the furniture. Because the furniture items can be wrapped up and protected, they can then be stacked on top of each other. However, you can’t place anything on top of a pot plant! Due to the fact that pot plants tend to take up so much space at the end of a load, it is best to be prepared for this in advance. If you have more than five to six pot plants, then the space required in the truck can start having quite an impact on being able to fit everything easily. 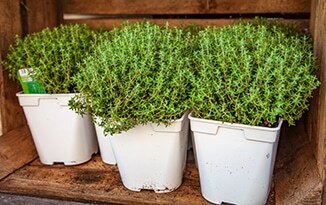 To reduce the costs of moving the plants, we advise where possible, to put smaller pots inside a box and tape the top closed. This allows our removalists to stack them as they would any other heavy box. What happens if we have lots of pot plants to move? We have had some very well-prepared clients in the past, who have advised us in advance that there will be over fifty pot plants to be moved and a 12-noon settlement time on their property. With prior warning, we were able to ensure that we took two trucks for that job. One truck was filled completely with pot plants and the second one was loaded with all the household items. As long as we know in advance that there is a large number of pot plants to be moved, then you can rest easy. We will always come up with a plan that will suit your unique needs. 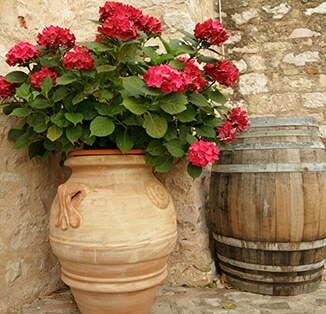 Can we move Wine Barrel pot plants? The answer is yes. We certainly can. There are, however, a few considerations that need to be made. If the wine barrel has been sitting in the back garden for years on end, then there is a good chance that some or all of the wood has started to rot. As the wood rots, it can make the metal hoops that hold the whole barrel together start to loosen and come apart. There is nothing more upsetting than having your wine barrel tilted in order to be moved, and then have the wood separate and the entire contents of the barrel come rolling out. Before moving day comes up, have a quick look at the quality of your barrels. You may need to consider getting a new half barrel or half cask and re-potting your plant, instead. 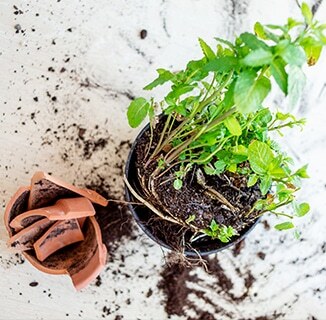 Can you move pot plants with cracks in them? Prior to moving day, quickly inspect all of your ceramic and concrete pots for any visible cracks that are forming down the sides. Keep in mind that as the pot is tilted and then transported, the existing cracks can worsen. If there are some large cracks visible, you should consider re-potting the plant into a plastic pot for ease of transport. We can then wrap up the ceramic or concrete pot and move it safely to your new house. You will then have the option of transferring the plant back into its original pot. Whilst it is not great for a plant to be transferred so many times, this is still the best option especially if the ceramic or concrete pot holds a sentimental value. Should I water my pot plants before moving day? We understand that transporting a very dry plant is not ideal. The stress of moving can negatively affect its health. 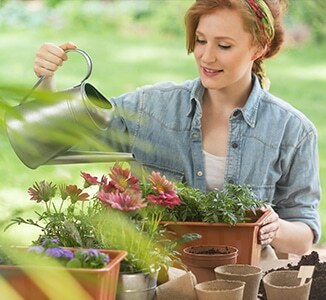 You might be tempted to heavily water your plants on moving day. But, trust us, you definitely don’t want to relocate pot plants that have just been watered! The problem with watering them before being moved is two-fold. The drain run-off will end up moving throughout the truck and potentially come into contact with your furniture and other items. You certainly don’t want muddy water going anywhere near your lounge. 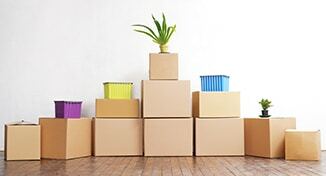 We suggest that you give them a really good water five or six days before your move, which will allow water to percolate into the soil and roots. If they start to seem a little wilted or dried out, then give them a gentle misting with a water sprayer. Never water them completely! Complete Removals is a premier removalist company with a proven track record for executing perfect stress-free moves. We have the experience and expertise in transporting your precious plants and we would absolutely love it if you let us help you move them. Do you need help in moving your plants to your new location? Contact us for assistance!